Episode 100 – We’re Doing it Live! It’s our 100th episode!! In time for our 4 year anniversary of the show! With the entire crew intact we celebrate the past 100 episodes and 4 years of doing the show. We then, of course, dive in to what we’ve been up to: Jen decided she needed a season 4 HC barb to smash things with, Breja is pushing higher than he has ever before, Nevik is riding the lightning, and Lanntonio … well … he did stuff? We read, listen, and respond to a deluge of email and audio submissions from Kherova, Funktropus, JDZ, Erick, and Papa Kangaroo aka Medros! Listener participation has been absolutely amazing and is primarily why we do this show, so keep them coming! We WILL get to all the emails we receive, even if occasionally we have to push a few to the next episode. Send in your stories of RNGesus triumph to Show@ShatteredSoulstone.com! We received a huge amount of tweets from @Kagerai_Leblue, @Kherova, @HomeTownHero008, @EYedgar0111, @wingthequick, @Walkman8, @Retro1Cherry, @playrider2, @Skullbash1241, @Leetawow, @GrandNagus1, @Raxxial, @scanline75, @gorgonzer, and @Cypherdies. Thank you for your tweets. Don’t forget that you, too, can send in your thoughts via social media outlets such as Facebook, Google+, and Twitter. What under-used class skill would you build a set around? We asked for your ideas on Twitter on what sets you would create. We were a little late in tossing this question out there, so we will be carrying over this question of the show for episode 101 giving plenty of time to come up with creative ideas. 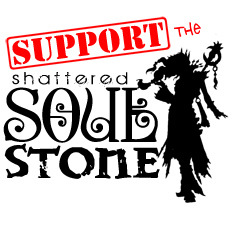 Be sure to follow the show account, @ShatteredStone, on Twitter for future Questions of the Show. Prompted by new listener Bulvine, we reminisced on how all four of us met and how the show came to be. Amazing to think that this all started over 4 years ago in the All Things Azeroth chat room. Blizzard made a boo-boo and accidentally released the possible Blizzcon 2015 schedule early. There was only one panel scheduled for Diablo III titled “Dev Talks” surprising many, even disappointing some that expected an expansion announcement. What could this mean? We share our thoughts and opinions on the schedule leak. Before ending out the show we were asked by our good friend Leviathan to share our favorite moments from the past 100 episodes and 4 years. Do any moments stand out for you? Send your own favorite moments to Show@ShatteredSoulstone.com. Ready to steel your nerves? Tanc managed to clear a GR71 with his season 4 HC monk to top the leaderboards, and he recorded it. If you’re curious as to the build that the previous video highlights, monk (well and other class) extraordinaire Quin shares his guide on what he coins the Static Charge monk. Just to prove that Nevik doesn’t 100% despise the puke doctor, he toughed it out to bring you Desolacer’s Spirit of Arachyr WD guide as well as a video where Desolacer lost his WD. Want to re-live the Diablo II days using the Starcraft II arcade engine? eGod put together the Curse of Tristram mod that you can find on the SC2 arcade. Here he shares a video of his barbarian squaring off against once D3 CM Bashiok. Finally we leave you with Part 2 of Dreamweaver23’s Hey There Kadala series(?) titled “The Sound of Ancients“. With episode 100 being so jam-packed with listener participation we tabled this section of our podcast until next episode. But go see The Martian.